Start with a small 6 inch plastic pot with good drainage holes. Use a mix that is light and fluffy and drains very well. 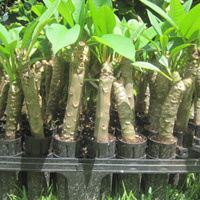 Sand and Cactus mix works great to root your plumeria. A little gravel at the bottom is best. Plant each cutting separately and plant the cuttings 3 inches deep in the cactus mix. Plant the flat dry end down. (1) Put the pot inside if the temperature is below 60 degrees outside. It needs a hot warm window sill for sun exposure or 8 to 10 inches underneath a 60 to 75 watt plant grow light for light and heat. The more light and heat, the faster the cutting will root. A patio deck, concrete area works great when it is hot. For extremely hot months, plant 1/2 sun and 1/2 shade for 2 weeks and then move to full sun. (3) Start to fertilize after 8 months. Fertilize with blooming osmocote. Osmocote is a time release fertilizer which last 6 months. 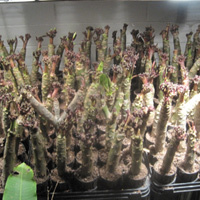 (4) Sit back and watch your plumeria from www.JustPlumerias.com grow and root into a beautiful blooming pumeria !